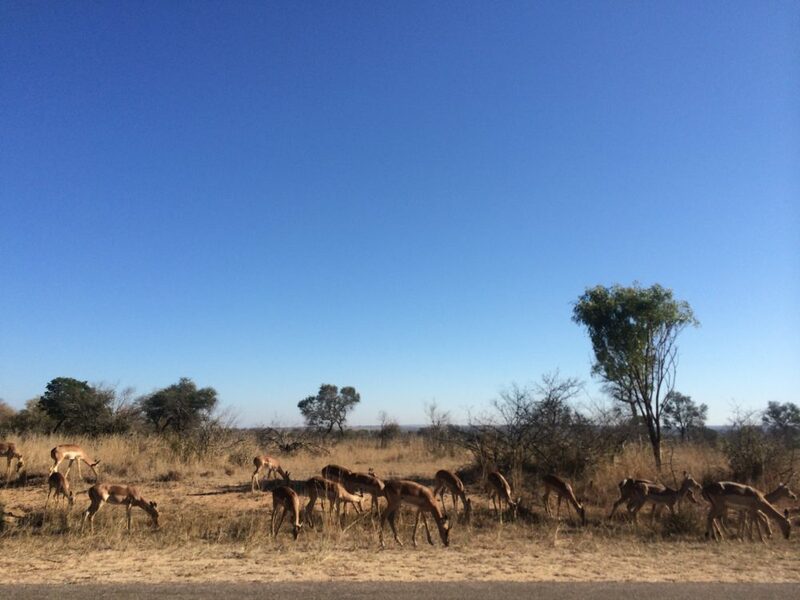 I am a biological anthropologist and organismal evolutionary biologist studying human evolution, life history, and the growth and development of the skeletal system. 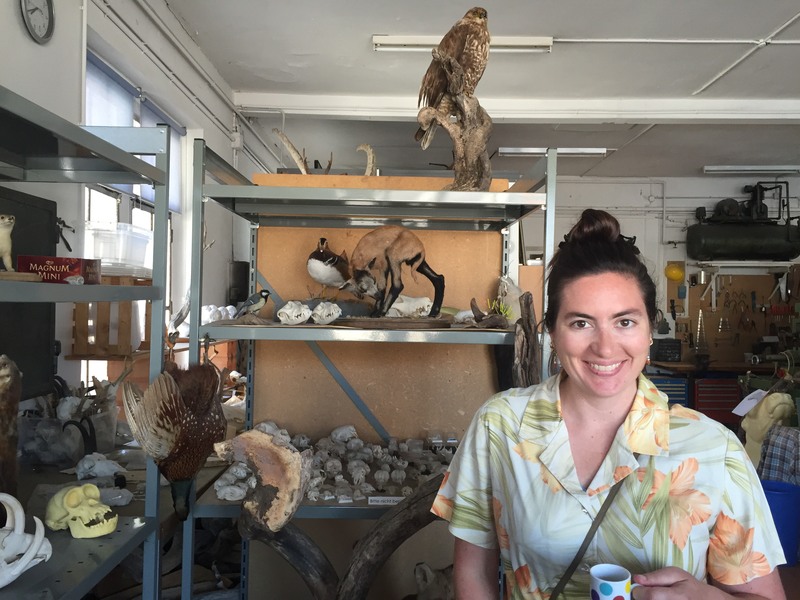 I am currently a postdoctoral researcher at the Anthropologisches Institut und Museum at the Universität Zürich in Switzerland where I am working on a project funded by the Swiss National Science Foundation investigating population dynamics and natural selection on the dentition of pre-Industrial modern humans. I was previously a postdoctoral researcher at the University of California Berkeley where I did my PhD in Integrative Biology, and I have a BA in cultural anthropology from Princeton University and a MA in biological anthropology from San Francisco State University. I have published first-author papers in the American Journal of Physical Anthropology, Journal of Mammalian Evolution, Palaeontologia Electronica, PaleoBios, Journal of Anthropology of Sport and Physical Education, and the Anatomical Record (in press), and I have co-authored publications in Proceedings for the National Academy of Sciences. While at Berkeley, I was the host and producer of a well-known science radio talk show called The Graduates on KALX 90.7 FM, and I have been invited to give talks and interviews about my work with the BBC, Inverse.com, the University of Dubuque, the Squaxin Island Tribe, Marin Science Seminar, East Bay Science Cafe, among others. I was head instructor of IB35AC Human Biological Variation at UC Berkeley Summer and Fall 2017. All the details of my professional life, including information about my research, outreach, teaching, and curriculum vitae, can be found on this website. Along with PhD student Rahel Brügger, I am hosting the 2019 Integrative Human Evolution Symposium! 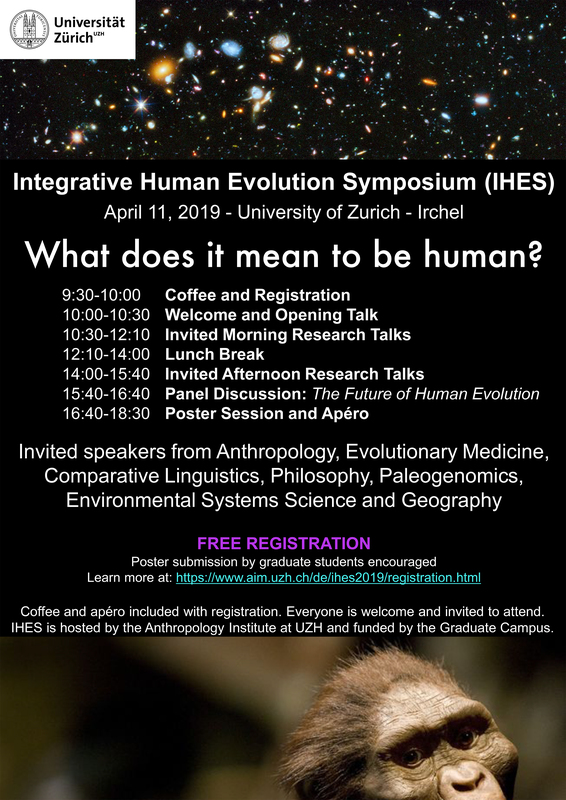 The Integrative Human Evolution Symposium (IHES 2019) is a one-day Symposium, the first of its kind in Zurich, to be held at the University of Zurich Irchel Campus on April 11th, 2019. The Symposium is free, open to the public, and in English. At the Symposium, invited early-career researchers from universities in Switzerland in the fields of Anthropology, Evolutionary Medicine, Comparative Linguistics, Philosophy, Paleogenomics, Environmental Systems Science, and Geography will talk about human evolutionary studies, past and future. We were awarded funding from the Graduate Campus at UZH to organize and host this interdisciplinary symposium, with four primary mission goals: 1) To provide career development opportunities for junior researchers (graduate students and postdoctoral researchers), 2) To facilitate an interdisciplinary research environment, 3) To promote a platform for diversity in academia and the sciences, and 4) To offer an opportunity for science communication and education. Everyone is welcome and invited to attend this free Symposium. If you are in Zurich, we hope to see you there!